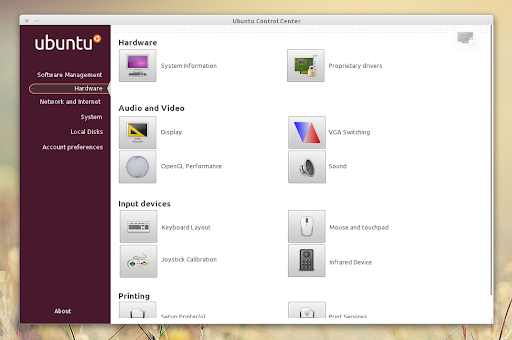 Ubuntu Control Center (UCC) is an unofficial application inspired by Mandriva Control Center, designed to bring simplicity and a less cluttered interface (because a lot of applications add themselves to the GNOME Control Center automatically) to manage the Ubuntu system settings for the simple user. Besides being an application you can use to launch various system settings, UCC also lets you switch between low and high performance graphics cards (if you have a netbook with 2 GPUs) which is possible starting with Linux Kernel 2.6.35. After quite some time, a new Ubuntu Control Center version was released which brings a new module that displays some basic system hardware info, integrated Y PPA Manager (to manage PPAs), Gnome-Lirc (for configuring IR devices), Nanny (parental control) and Font-Manager was removed. The new version also doesn't automatically install the applications you can launch from its interface as dependencies so you don't have to use all of them if you don't want to ("sudo apt-get install hardinfo bum startupmanager nanny gufw gparted deja-dup" will install most of them; also see this for installing Y PPA Manager). Thanks to Benjamim Gois for the tip!